Walking – Charlottesville is easy to explore by foot. In fact, the best way to learn more about this area is to put on your walking shoes and go! Luckily, the city is geographically small, so you could easily walk from one end to the other in an hour or two. If you are Downtown, take the time to walk on the Downtown Mall and wander through some nearby neighborhoods. Wander through the University and see Thomas Jefferson’s architectural triumphs and if you’re feeling hardy, continue on to Observatory Hill, which is on the edge of Grounds and offers a strenuous 2-mile loop up to the top – stopping to take photos of the old observatory – and then back down. 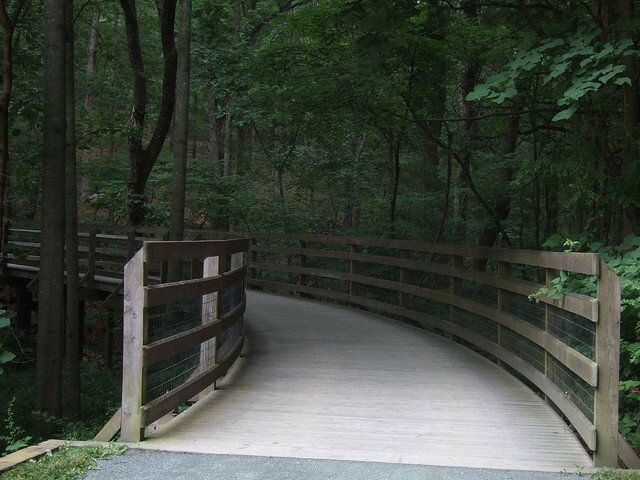 If you would like a more rural walk, check out the Rivanna Trail along the Rivanna River. The path is mostly paved, which makes it great for families with wee ones in strollers. If you want gorgeous views, go over to Monticello and hike the Saunders Trail, which winds up toward Monticello. The trail has an incline of 2-5% and is a combination of paved crushed gravel and some boardwalks, which makes it accessible for many people. Running – Charlottesville is a great place for runners and you’ll see them out at all times of the day and in all kinds of weather. If you prefer urban running, you’ll find that most of town is pedestrian/runner friendly, just be aware of traffic around you. If you want something a bit more rural, see the walking suggestions (above) and hiking suggestions (below). One new trail not mentioned elsewhere is the Meadowcreek Parkway trail, which is a hilly paved path that runs parallel to, but not immediately next to the road. The Charlottesville Track Club (charlottesvilletrackclub.org) has a calendar of races throughout the year and training groups where you can meet other runners. Or head over to Ragged Mountain Running Shop on the UVA Corner – the Lorenzoni family has been helping runners with their shoes and gears for more than 30 years. They can also provide you with maps of great runs of various distances around the area.